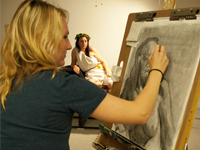 Drawing, painting, and photography at Chapman are taught with the goal of providing students with a contemporary repertoire of technique, history, and theory from which they may create their own contributions to the medium’s ongoing story. 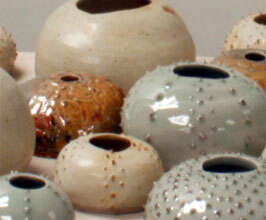 The ceramics and sculpture courses offer a solid foundation of technique, history and theory that exposes students to clays possibilities as a contemporary art medium, while encouraging students to experiment within a vibrant studio atmosphere. Art 385 allows students from across campus to explore the ways visual systems of representation in art can intersect with contemporary science. Students in the BFA in Art program partake in many shared learning experiences throughout the comprehensive studio art curriculum. Freshman and sophomores explore a broad range of media in foundational studio courses designed to develop technical proficiencies. 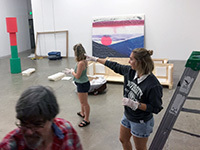 Sophomores and juniors explore a range of contemporary artistic practices through required courses in Contemporary Gallery Practice, Modernism and Contemporary Art History. Juniors and seniors take four intermedia interdisciplinary studio art courses that promote critical and conceptual thinking as they develop individual artistic voices. 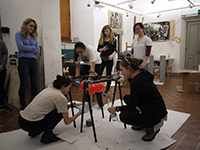 The senior seminar course is the capstone experience in the program requiring students to write a thesis statement and install an exhibition of their artwork in Chapman’s Guggenheim Gallery. Students also work together as they install shows that are judged by visiting professional artists and gallerists each semester. Students will be expected to use identifying and comparative language to explain how their own artwork is positioned within the general context of contemporary artistic practice both orally and in writing. Student will be expected to produce/create artwork that evidences a mutually reinforcing integration of form and content. Students will be expected to participate in personalized education that will help him/her develop an independent, informed and articulate voice as an artist, which he/she will demonstrate through their studio work, artist statement and BFA exhibition. 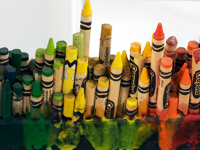 Students will develop writing competencies commonly used in the discipline of contemporary art: The ability to write both descriptively and analytically about works of visual art both their own art and that of others in a variety of media. AP Art scores can be counted towards GE credit but will not be considered to count towards the major in art. The Department of Art presents monthly lectures designed to explore visual culture from a wide range of art professionals across disciplines offering opportunities to learn, be inspired, and network. The Art Club is a student led organization that provides a platform for community and social activities related to artistic practice outside of usual course curriculum. Students visit contemporary galleries, museums, artists’ studios, attend lectures and art openings, immersing themselves in the dynamic Los Angeles based art community. (Art Club Facebook Page). 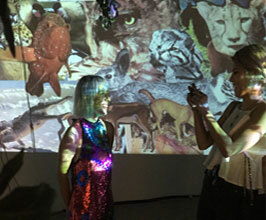 The intermedia and interdisciplinary coursework educates students in the expanded field of contemporary visual art, exposing them to the ways in which artists today challenge traditional categories of art-making through a wide range of strategies, from collaborative public interventions to curatorial projects. Students will be exposed to the cutting edge of artistic discourse — addressing issues that are relevant to the culture at large, from sustainability to popular media — from the critical and informed points of view, while being encouraged to take part in projects that empower students and help them develop their voices. The wide-range of material covered in the 385 series coursework prepares students for a career in the arts, whether as coordinators, curators, fund-raisers and organizers, or artists, teachers, critics. In many cases, an art career in the 21st century asks that artists be all of these things and more. Students will take a 384 series course each semester their Junior and Senior years. Some examples of the concepts in conceptual art courses are: The Intersection of Science and Art, Collaborations with NASA’s Jet Propulsion Laboratory, Curatorial Practice, Collaborative Practice, Installation Art, and Spirituality in Art. Students independently organize and produce work and participate in a group exhibition in Spring of their Junior year. In their Senior year, students prepare for a Senior Exhibition with a committee in the Fall which prepares them to produce and exhibit their capstone work in Spring. This path gives students an opportunity to develop an independent voice while having creative and academic guidance from faculty who are each professional, practicing artists. The art department has established relationships with several top tier galleries in Los Angeles, and can offer students competitive internships that provide professional experience and an insider’s look at the contemporary art world. We offer internship opportunities at: Cherry and Martin, Regen Projects, Ghebaly Gallery, LAXART, Angles, Jancar Gallery, Kopeikin Gallery, Cottage Home, and others. 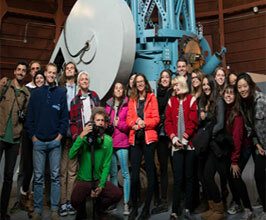 Students are also encouraged to intern at the many other galleries and museums in the LA area. While most studio classes include sections on the presentation of art, our students study the history, theory and day to day business of running a gallery and curation through courses such as Art 296 Contemporary Gallery Practice and Art 384 E Curatorial Practice. Students will interact directly with Museum Curators, Gallerists, Gallery Directors and Artists, learning first-hand about the presentation of art work in professional settings, such as museums, commercial galleries, non-profit art spaces and artist run galleries. In our campus gallery and project spaces, students have the opportunity to experiment with the learned concepts and their individual ideas curating their own exhibitions and producing accompanying material, such as press releases, exhibition essays and exhibition documentation. Student exhibitions are installed during the entire semester, and often run simultaneously in our two main spaces Flaboheim on the second floor of our Guggenheim Gallery, and in the Cubenheim, an architectural sculpture which was created in the class Art 313 Advanced Sculpture, and turned into a temporary exhibition space. We encourage students to participate in study abroad programs. Studying overseas provides a unique opportunity which can open up fresh perspectives on international political, economic and social issues, interpersonal relationships and ultimate career choices. Recently students have studied in countries such as Italy, Costa Rica, England, France, Argentina, Germany and Spain. One course, Origins of Art and Science: the Rise and Influence of Alchemy, Anatomy, Machines, and Astronomical Discoveries in Art of the Italian Renaissance, is offered during Interterm every other year, in Florence, Italy. 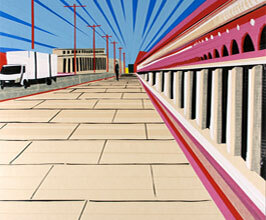 In addition, every other summer, we offer “Contemporary Art in Berlin and Venice”. This course offers students the opportunity to spend two weeks visiting galleries, artist studios and underground spaces in Berlin, Germany, and one week visiting the Venice Biennale in Italy.